NEW ORLEANS — After a relatively slow start to the season, competition is heating up in men’s collegiate track & field and one look at the February edition of The Bowerman Award Watch List shows exactly that. Gone are three names from the January Watch List and in their place are three new ones including two standout freshmen and a mid-distance specialist who not only ran one of the fastest times in collegiate history, but world history. Also Receiving Votes: KeAndre Bates (Florida), Clayton Brown (Florida), Michael Cherry (LSU), Eric Futch (Florida), Colby Gilbert (Washington), Johnnie Jackson (LSU), Michael Norman (Southern California). Let’s start with the newcomers to the Watch List: Penn State’s Isaiah Harris, Florida’s Grant Holloway and UTEP’s Emmanuel Korir. Holloway made his mark immediately upon his collegiate debut. The Virginia native torched the track with one of the fastest times in collegiate history over 300 meters at the Orange & Purple Classic (32.80) and added a scorcher in the 60 hurdles (7.63) that still stands as the collegiate lead. A few weeks later Holloway soared 8.05m (26-9) in the long jump to become the second man since 1999 to go sub-7.70 and 8.05m or farther in the same indoor season (2010 The Bowerman Award Winner and two-time Olympic gold medalist Ashton Eaton is the other). Harris and Korir are sort of tied at the hip with their performances this season and seeing them race at the 2017 NCAA Division I Indoor Track & Field Championships in March will be a treat. In early January, Korir opened with a time of 1:46.50 in the 800 and then reeled off an all-time world best over 600 meters of 1:14.97 that stood for two weeks. Harris then eclipsed Korir’s time in the 600 by one hundredth of a second this past weekend (1:14.96), but it wouldn’t stand as an all-time world best like Korir’s because Harris finished runner-up to the new record holder Casimir Loxom. Korir and Harris are currently 1-2 in the 800 among all collegians. Here are the seven athletes Harris, Holloway and Korir joined: Edward Cheserek, Christian Coleman, Filip Mihaljevic, Byron Robinson, Curtis Thompson, Lindon Victor and Rudy Winkler. 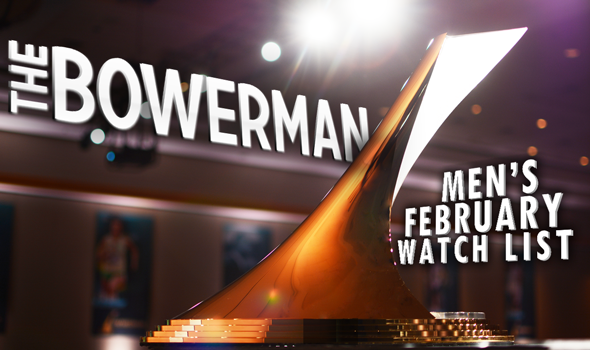 Of those on the February edition of The Bowerman Award Watch List, only Robinson and Thompson have yet to debut. Cheserek took to the track this past weekend at the East-West Challenge at The Armory and competed twice. He anchored Oregon’s winning DMR team on Friday and won the 3000 the following afternoon. Cheserek now has 23 career Watch List appearances, which puts him one behind former Arizona star Lawi Lalang’s record of 24. Coleman has been rock solid this season in the sprints. The Tennessee junior is the national leader and world leader at 60 meters (6.54) and is tied for the world lead and ows the national lead at 200 meters (20.49). Coleman went sub-6.58 in the 60 twice this season, with both coming at the Commodore Invitational. Mihaljevic has yet to find his footing after a long 2016 season that ended at the 2016 Rio Olympic Games. The Virginia thrower currently sits in a tie for 4th nationally in the shot put with a heave of 19.47m (63-10½). Victor recently competed in his first heptathlon of the indoor season and finished runner-up at the Razorback Invitational. The Texas A&M senior totaled 5805 points (which did set a PR) and is currently 4th in the nation. Like Mihaljevic, Winkler threw at the 2016 Rio Olympic Games and has yet to shake off the cobwebs. Winkler is tied for 9th in the nation in the weight throw. A plethora of athletes were mentioned by The Bowerman Award Watch List Committee, but didn’t receive enough votes to be on the Watch List: Florida’s KeAndre Bates, Florida’s Clayton Brown, LSU’s Michael Cherry, Florida’s Eric Futch, Washington’s Colby Gilbert, LSU’s Johnnie Jackson and Southern California’s Michael Norman.